This commentary is in response to the article by the Star Tribune regarding the new executive director of Minneapolis Public Housing Authority, (MPHA) Gregory P. Russ. Let me share my story, I am a low-income Section 8 voucher renter. I used to live at CrossRoads at Penn Apartments in Richfield with my Section 8 voucher. This was one of the largest buildings in the metro area with 700 apartments. CrossRoads at Penn supported all low-income families or disabled residents who were on fixed income. Our Section 8 vouchers and other subsidy programs paid full market rate to the private landlord, along with 30 percent of our income to rent. The apartments were near a bus line. I had access to a shopping mall, my church, all-medical and a community I called home. With a 30-day notice, the new owner told us that we had to leave. CrossRoads at Penn was then converted to the upscale Concierge Apartments, displacing thousands of people. We had no place to go with our Section 8 vouchers. We were pushed out of the community I called home. Without a car now, I have relocated 1.5 miles further west. I am homebound without proper bus service, in a food desert and – often – not even sidewalks. As one of many without support from my city, my elected officials or that new developer, I will suffer repercussions of poverty in the loss of my home for years to come. Many, many low-income or income-based apartments are being lost in the Twin Cities while institutions whitewash what they are knowingly doing to working class, low-income families and the poor. People of color, diverse immigrant communities and people with disabilities are being deliberately removed and further disenfranchised. Whole communities are being destroyed. You who are watching gentrification for profit and communities being destroyed are allowing it to continue. What we experienced in CrossRoads at Penn will also happen to MPHA Glendale Residents when the new executive director Gregory P. Russ takes office in February. Without proper community engagement, MPHA’s search committee made up of Minneapolis City Council Member Lisa Goodman, MPHA Commissioners such as F. Clayton Tyler and others recruited this man all the way from Cambridge Public Housing in Massachusetts to destroy Glendale and other public housing in Minneapolis. Russ’ record shows that Cambridge Public Housing was all converted to private development, gentrification took place, and rents went up during Russ’s leadership as the executive director in Cambridge. Why did they bring Russ here? Because he is the national expert of converting public housing to private developments. This will displace Glendale residents just like CrossRoads. We have to remember Glendale Townhomes is public housing on public land; not Section 8 which is for private developers. But, once Russ converts the land to private development, there is no way these families will keep their homes or community. Just like what happened to us, Russ will first displace residents, then he will convert the land from public to private property. The land may be empty for years, as development for new condos will then take place. The private landlord, if they have a kind heart, may house a few, minimal Section 8 apartments that will hardly be adequate for the original community of Glendale or be enough to also house the long waiting list for income-based housing. The Glendale Townhomes will get a new fancy name – just like my home Crossroads became “The Concierge” – to erase the significance of the historic community of Glendale. Then it will be out of the hands of MPHA, and in time the Section 8 residents will be told to move out when the landlord makes the property 100 percent upscale, market-rate apartments, or even condos. The few, last standing income-based apartments will then be out of the Prospect Park neighborhood. It will not look the same, feel the same or be the same. You will not see children playing in the park, their daily school buses, or families enjoying their community center for after-school programming. This will all be done in the name of profit and gentrification. 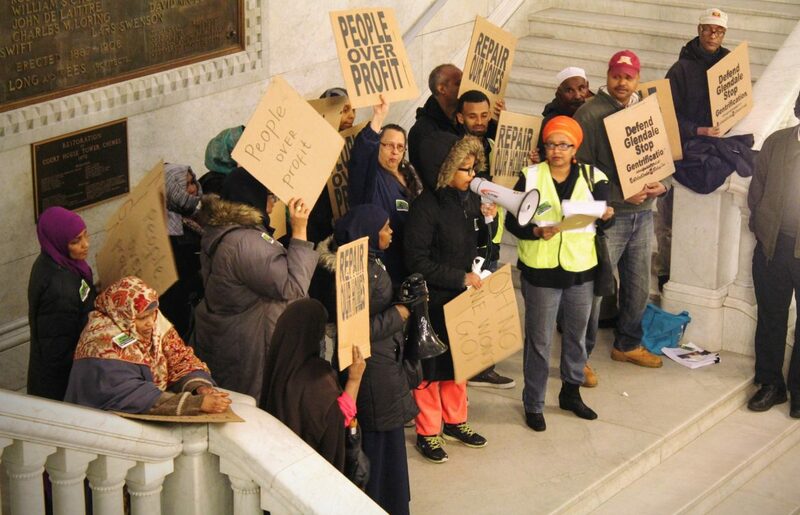 It is sad and unfortunate that the Minneapolis City Council, who is responsible for MPHA (and who all voted yes for Russ’ confirmation) are ignoring the trend of massive gentrification and destruction of communities. They are setting for decades of development to come by approving Russ and his agenda. I hope our city officials, commissioners, mayors, senators, governor and local and state representatives will urgently wake up to this housing crisis and the attack on low-income, working class and poor people before it destroys our beautiful state of Minnesota. With so many terrible things going on this move may not get the attention it should. Where will these people go when they lose their homes? This is a good example of why we need government to set some rules because private business will not provide for these people. The public in the end will end up paying for shelter for these people. If there are ways to stop this type of take over, let me know. The Democrats and the Republicans have been steadily moving away from supporting Sec. 8 and other Public Housing Programs for some time now. Yes, Clinton, Bush and Obama. And the Developer President, is going to do more of same. We can create alternatives. We just need to plan and organize. This commentary unfortunately takes a very real problem—the turnover of apartment buildings and loss of private-market affordable housing—and applies it to paint a fearful scenario about the entirely unrelated public housing at Glendale. It is undoubtedly true that “upscaling” like what happened to the author is helping to drive gentrification in the Twin Cities, and that people lose their homes as a result. Her personal story is common, and tragic. It illustrates that deep challenges we all face to provide enough truly affordable housing for all. However, once the author turns to the very different context at Glendale, the piece becomes a series of false statements and fearful predictions that are not supported by evidence or by MPHA’s track record. The series of events the author states “will” happen most certainly will not happen–as MPHA has said many times, to anyone willing to listen. Contrary to the difficult situation of tenants who, like the author, may be at the whim of private landlords and developers, MPHA intends to preserve all of the affordable units at Glendale–with no increase in rent, and the right of every existing family to return. We do not intend to “gentrify”; in fact, we intend to use our ownership of that land and our responsibility to our residents to remain a bulwark *against* gentrification–by preserving those homes for very low-income families. MPHA does not have a record of doing what the author describes, and we do not intend to start. We look forward to working with the community to find a way for our oldest major property to continue to serve its vital purpose for generations to come. Amen, Ms. Soderstrom and Amen CYnthia Jackson. As to MPHA – I watched what you did at “Heritage” and I agree with Cynthia. You are a lying bunch of (fill in the blank)s. CIty Hall has been run of the wealthy, by the wealthy, for the wealthy since Rybek was in office, and doesn’t appear to be changing for the better any time soon. It’s clear from Heritage Park that people get displaced when Housing doesn’t pay attention and follows the sparkling stars. The fight is on its 3rd year. If it was not for residents fighting back, Glendale would be demolished by now, and families displaced for profit. When MPHA GIVES AWAY the 14 acres for free and adds tax increment financing for 20 years (always renewed for another 20) so there is no tax revenue and tosses in millions for utility reroutes, road changes and more “grants” and Fed tax $$ for “innovative private” development for “low income housing” the private developer gets it all for free. 14 acres of clean land next to parks, transit, schools, jobs is worth $10s of millions. And then they throw away the buildings that are 40-50 years newer than the rest of Prospect Park. And then public financing with the public on the hook if it all goes pear shaped and defaults (just like Cedar Riverside defaulted). My life was ruined when the Santa Barbara County Housing Authority took away my section 8 voucher. I lived in my home town for 60 years and had to move 700 miles away just to have a roof over my head where I know no one and have no support services . I have to come up with enough money every three months to take the train there to get medical care. I use a wheelchair and walker, I am disabled senior . It’s happening everywhere. By the way, I had a good record: always paid my rent on time, clean and quiet. They wouldn’t even give me a hearing which they were supposed to do. Thank you for sharing your story. Yes, we must stand with Defend Glendale Townhomes – and against the whole gentrification plan making our city a worse and harder place to live. What is more essential than a place to live? No to gentrification! Yes to people power!